Now that Octagon rookie Andre Fili has agreed to serve as a last-minute substitute to fight Jeremy Larsen on October 19, the 13-bout lineup for “UFC 166: Velasquez vs. Dos Santos III” has once again been finalized. Toyota Center in Houston, Texas, Dwight Howard’s new home (you’re stuck with him now, Rockets! ), hosts the festivities. 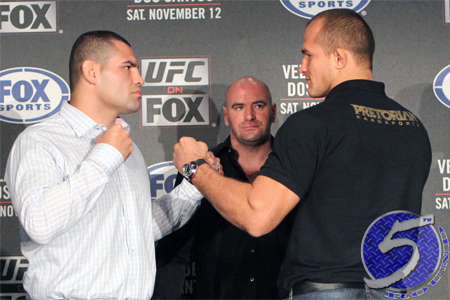 The most anticipated heavyweight trilogy in UFC history headlines the show when champion Cain Velasquez puts his strap up for grabs against Junior dos Santos in the night’s featured attraction. Bitter rivals Roy Nelson and Daniel Cormier serve as the co-main event. The UFC’s Facebook page kicks things off by streaming the card’s first four fights live at 6:15PM ET/3:15PM PT. Fox Sports 1 will then air the remaining prelims at 8PM ET/5PM PT.